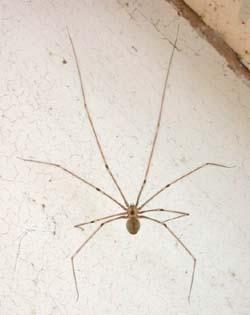 Identification: Reddish brown, long stilt-like legs; knees are up in the air but body is close to the ground. Body is oval and compact, not divided by a slender waist like spiders. Biology and life cycle: Female inserts individual eggs into the soil. One generation a year. Eggs overwinter. The female can overwinter in the southern part of the state. Habitat: In caves, around rock buildings, in knotholes. Feeding habits: We have never seen them eat anything. Some authors say they eat small insects, some say dead insects or any organic matter. They apparently feed at night. Economic importance: Add beauty and fascination to nature. Natural and organic control: No control needed. They are not known to have any bad habits. Insectivorous animals are known to feed on them. Insight: 200 species in North America, around 3,500 worldwide. The different species are hard to tell apart. The adults are found in large gatherings and look as if they are all tangled up, but they easily move apart if provoked. They resemble spiders but are not. The creatures most correctly called daddy-longlegs are in their own separate Order which is Opiliones. 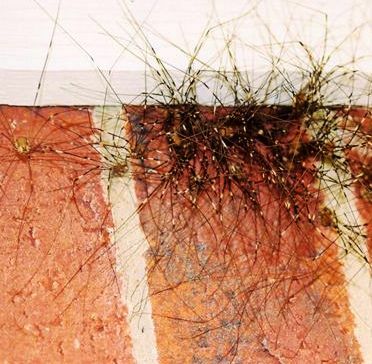 Common names for this Order are 1) daddy-longlegs, 2) harvestmen and 3) opilionids. They are characterized by having one basic body segment which shows segmentation on the posterior portion, at most 2 eyes and all 8 legs attach to the pill-like body segment. They do not produce silk so therefore they are never found in webs unless they are being eaten by spiders.